ASUK Chair, Michelle Hough has made a short film of her interpretation of the beautiful Portia’s Song from Friends and Heroes. To raise awareness of Alström Syndrome please watch the video via the YouTube link and share on Facebook, Twitter and any other social networks you are involved with. ASUK Trustee, Alex gives an inspirational interview about not letting your disability define you, and always remembering it is what you can do that counts. ASUK Trustee, Kez and his Son Hassan give an insightful interview about being diagnosed at 17 years old with one of the rarest conditions in the world, Alström Syndrome. 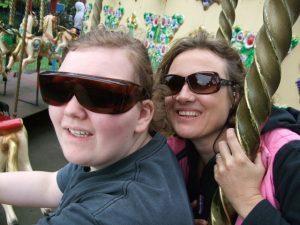 Two Mums, Julie and Pam talk about their own personal journeys of their children being diagnosed with Alström Syndrome and the importance of support. Watch this truly thoughtful video below to see interviews with Clinicians and professionals during the ASUK Conference. Talking about the AS multi-disciplinary clinics, research initiatives and why it is essential to bring everyone together to share information and knowledge to widen our understanding of this ultra rare complex condition, Alstrom Syndrome. Chris, who has Alström Syndrome, with limited sight and hearing loss, shares his thoughts on wall climbing. 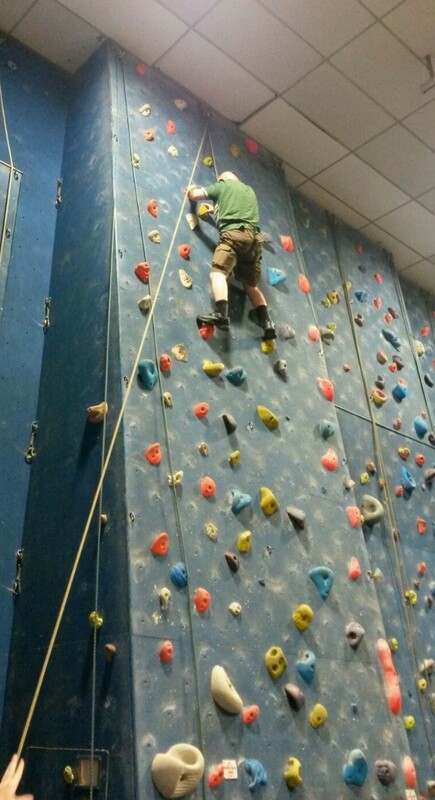 “On Friday 25th August, I went along, with a local group of 9 people, all visually impaired, to Westview Leisure Centre in Preston to have a go at indoor rock climbing. I was a bit hesitant as I wasn’t sure what was going to happen. The instructor told us all about the climbing wall. You basically get into a harness that you wear around your thighs and waist and it’s attached to a big rope, like a tow-rope. Before they let me near the harness, I had to do some exercises to warm up my muscles. The harness was quite comfortable and felt like I was sitting in a seat. Once the rope was attached I started to climb the wall. I had to feel for grooves and holes in the boulders on the climbing wall. The holes were all different sizes and different heights. I had to pull my body up by using my hands and feet. 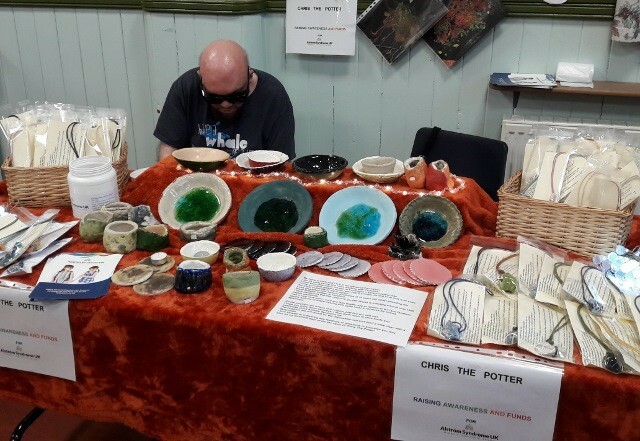 ASUK would like to say a HUGE THANK YOU to Chris, who has been raising funds and awareness of Alström through selling his own pottery creations at a local Craft Fair in Freckleton. Many of you entered the Seeing Ear Poetry Competition and your poems are going to be published in the anthology, well done! The poems were written to commemorate the 100 year anniversary of the start of the 1st World War and are published below. 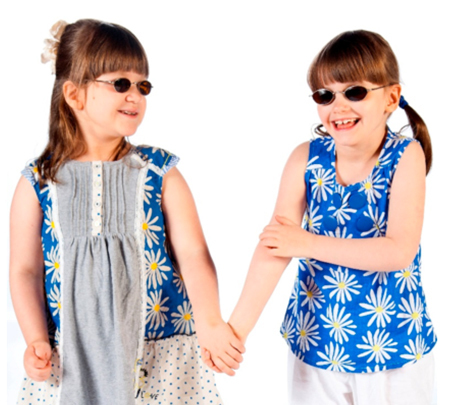 Twins Katie and Hannah Beck (pictured here) and Hannah Bromley-Challenor have had theirs published. Who will…March up the hill? Who will…Dig trenches all night? Who will…Wear wet dirty clothes? Rain poured harder that night as if it was sad to see innocent brave men die. They laid in lines of ten, men young and old were at their fatal end. Telegrams sent to every family with the bodies of the brave. Some were left. They were on their own now, in the pouring rain in a foreign field. All because no-one could see or even remember a glimpse of who they once were. They lay in holes and bomb shell holes alike, all in foreign mud and drowned in their own blood. They were far from their true home where their loved ones and friends remembered the soldiers. But one was given the chance. To return and show in the glory of the whole of Britain that he and only he will represent the lost men. Ones who died in their duty to England, who never came back. He is always there. Now, in the Abbey for his spirit is the one shoulder everyone can cry on. 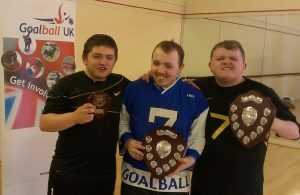 ASUK members Curtis and Taylor won the novice goalball league and Liam won the intermediate league. Taylor ended up as leading goal scorer! This is a great achievement – Well done Lads!! Liam enjoys this sport so much he has even tried coaching! Are you interested in playing goalball? Or becoming a coach or an official? Goalball UK are launching new clubs around the country. Consequently a number of free ‘have a go’ sessions are being held for potential players, coaches, officials and anyone generally interested in the sport to come along and learn more about it. 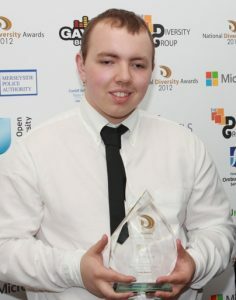 Liam has set a new marker for anyone suffering from rare diseases – by becoming the positive role model for disability in the National Diversity Awards! Liam gained his most prestigious award yet – and, in doing so, introduced a whole new influential audience to the great work being done by Alström Syndrome UK. 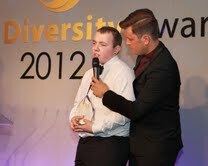 Liam was nominated by his Mum Liz Little and she accompanied him to the Midland Hotel in Manchester in late September for the black tie awards ceremony sponsored by The Diversity Group – one-stop shop that delivers a wide range of multi-media services to reassure and encourage people from the most disadvantaged areas to further their careers. “In all, there were over 8,000 nominations over all the categories and Liam was in the final three for his. We really didn’t think he stood much of a chance. In our typical fashion we got changed in a services toilet! We went in our scruffs and came out all dolled up! “It was just like an award ceremony you see on TV and afterwards Liam did a bit of networking with a lady who works at an Asian newspaper, we enjoyed a three-course course meal, then it was award time. “We were over the moon when Liam won, I walked him to the stage where he received his award from Jodie Cundy – paralympic star- then Brian Dowling (host of Big Brother) brought over the microphone for Liam to say a few words. “Liam thanked Alström Syndrome UK, Living Paintings and The Children’s Society for all their support. “Ruth Brown (the Voice) then sang a few songs and we got home around 2.30 in the morning,” explained Liz. Liam had been nominated for the work he does for the three charities- work which includes street collections, training volunteers who want to work with children with disabilities, working with a group of young people with hidden disabilities to gain skills, confidence and Independence and going round the country giving speeches. 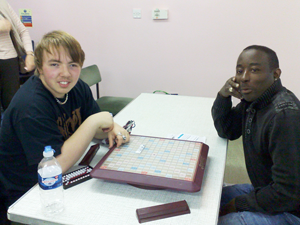 Liam Mackin (previously known as Liam Midwood) has made a bit of a name for himself at scrabble. In a recent scrabble competition at Shipley Scrabble Club in Yorkshire, Liam competed against people more than twice his age and won 2 of his 4 games. “I was amazed at how well he played,” says Kerry Leeson-Beevers. Our picture shows Liam winning his second game! Listen to Liam turn traditional nursery rhymes on their heads.